Doctor Menard (Richard Johnson) fires a shot into the head of a sheet wrapped body and says, "The boat can leave now. Tell the crew." We next see the boat adrift outside of New York Harbor. While searching below deck, a policeman is attacked and killed by a blood-covered man. The yacht belongs to David Bowles, a famous scientist, so a newspaper sends reporter Peter West (Ian McCulloch) to the boat to investigate. There he meets Ann Bowles (Tisa Farrow), the missing man's daughter. She has not heard from her father for more than a month. Peter finds a note from Ann's father on the boat, but will not show the note to Ann unless he can go with Ann to find her father. She agrees. The note David Bowles says that he has contracted a strange disease on the island of Matool. Ann and Peter fly to the St. Thomas islands to rent a boat to Matool. On the island, the doctor's wife Paola (Olga Karlatos) is arguing with him, saying that she is afraid and wants to leave the island. Doctor Menard assures her that they will leave as soon as he understands the phenomena which she calls "zombies." The boat arrives at Matool where they meet Dr. Menard and his nurse (Stefania D'Amario). Menard tells them about David Bowles' death, and how the island is plagued with zombies. The doctor fears for his wife's safety. He loans them his Jeep so they may drive to his house to protect her. When they get there, the group discovers zombies eating the body of Mrs. Menard. The house is swarming with ZOMBIES! Their only hope is to get back to Menard's hospital, miles away. On the road back they run into a mob of zombies and wreck the Jeep. Night falls as they struggle through dense jungles, with hundreds of zombies between them and their goal. Their journey back to the hospital, and what awaits them there, leads to the story's chilling conclusion. 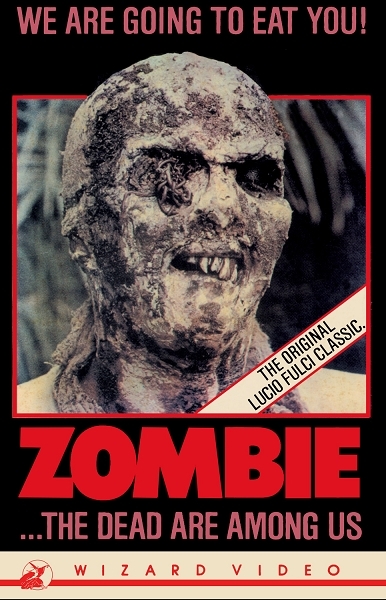 Considered one of the best Zombie Movies ever made! Contains one of the best zombie scenes ever filmed; see a zombie Vs a shark!